Prior to the sentencing hearing, Sims was already serving that life sentence in the Tennessee Department of Correction. That said, defendants are eligible for parole after 51 years. However, prosecutors sought to have Sims serve additional time for his attempted murder convictions, a Class A felony that carries anywhere from 15 to 25 years. Into the picture came Chattanooga defense attorney Joshua Weiss. The defense lawyer said Sims’ hearing came down to a simple question: “Does he most likely die in prison, or does he definitely die in prison?” Weiss got in contact with several family members and friends of Sims who provided a different viewpoint. The criminal law attorney realized Sims grew up without a father, was sexually abused at a young age, and was bullied into fights at school. Hamilton County Criminal Court Judge Barry Steelman sentenced Sims to 25 years for each attempted murder charge. But Steelman chose to run them “concurrently” to the life sentence. Simply put, this means Sims won’t serve additional time for them because they’re running simultaneously and not separately. The criminal law attorney Weiss confirmed that if Sims is ever released on parole, he will be at least 68 years old. 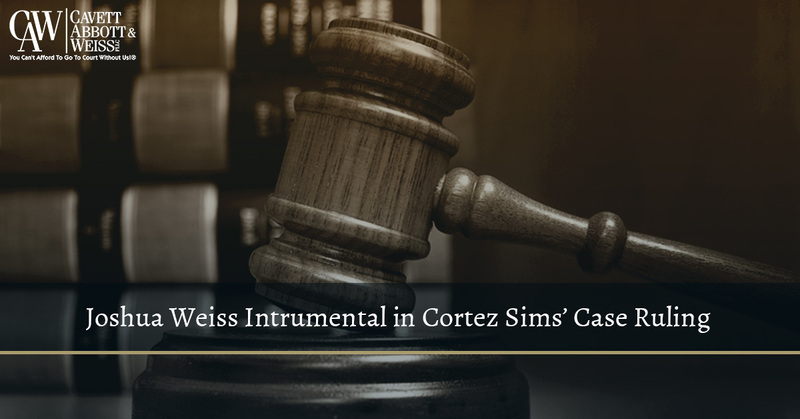 The Cortez Sims case is just one of the many positive outcomes for Mr. Weiss. The federal criminal lawyer represents individuals and businesses in a wide range of legal issues. Mr. Weiss can effectively explain the law and legal process in order that his clients can make an informed decision about how to proceed with the case. At the law office of Cavett, Abbott & Weiss, our criminal defense lawyers work to provide effective, efficient, and reliable counsel. We are proud to represent clients in matters including title insurance defense, buyer/builder litigation, commercial and residential construction disputes, breach of contract, boundary line issues, quiet title lawsuits, and criminal defense. Our lawyers are ready to put their more than 60 years of combined experience to work for you. Call now to schedule a consultation with our law firm. You can’t afford to go to court without us®.